The settings in our memoir must feel real. Readers must be able to visualise that world and see us in our surroundings. If it does not seem real, the book isn’t working. In memoir, we are re-creating a world, and the best way to make it seem real is to give it ordinary details. Pick details that will be instantly familiar to people: food, clothing, building materials, types of vegetation, and animals. The trick is to re-create a real world in a fictional way. Time of day. You don’t have to give the actual time. Is it morning or evening? Use shadows, temperature, the position of the sun, and activities that indicate time. Seasons and weather. In Spring, use new leaves, buds, sunlight, etc. In Winter, use bare trees, snow, etc. Perspective and distance. We see the world around us – even if we aren’t always aware of it. We notice clouds, smoke on the horizon, the texture of stonework or wood. You can also use sound to define space and distance. Use close-ups. Changing perspective brings scenes to life. If you were hiding, what did you see in your immediate vicinity? What did hear and smell? When people are hiding, they tend to be acutely aware of their surroundings. If you were running away, you would be looking ahead and have a longer perspective. Other people. We usually notice other people first, and things second. Use this when you describe your world in your memoir. Only describe things first if you are alone or if the thing was a damaging hailstorm or something equally distracting. Look down. Something that will help to ground your readers in a setting is literally what was under your feet. If you were inside, what were the floors made of? If you were outside, what was the ground like? Was there a lawn or a dirt yard? We experience a lot through our feet without really thinking about it. Remember to relate the condition of the ground to the weather. For example, rain would lead to puddles and mud. Choose the most important settings you will be using in your memoir. Complete the worksheet below. A lack of setting has several adverse effects. I have included them in order of importance below. A lack of real interaction. A lack of environment means you can’t interact with your environment properly. You can’t invite the reader into your world. As a writer, you are forced to rely almost exclusively on facial expressions for your actions. So you end up going through a limited and repetitive series of actions and reactions. A one-dimensional character (you). The way you interact with your environment, what you notice, what you like, what impresses you, what scares you adds to the rounding of yourself as a character. A lack of details. Readers love details. You have to remember each setting, and then fill in the details, even if you only use a few. You need enough to give a sense of place. It will ground the memoir and make it feel real. Your reader is reading the book to be there vicariously. To be there, the world of the book must feel real. A lack of things to do. Once your environment has been established, it is a lot easier to give yourself things to do while you’re talking and thinking. A lack of atmosphere. 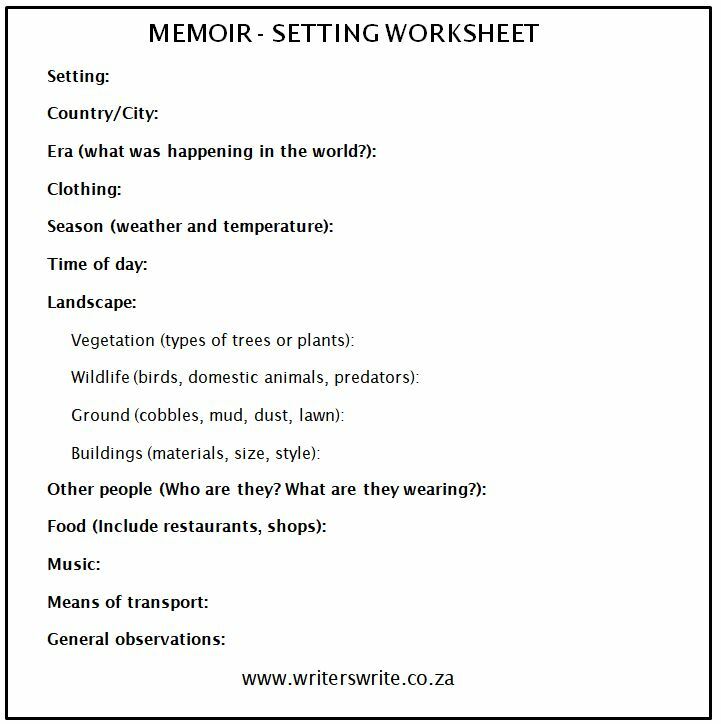 Use the setting details and environment to express mood and create atmosphere in your memoir. An inability to relate. The reader needs to be able to distinguish and remember scene from scene, and with little or no setting they can’t do that.